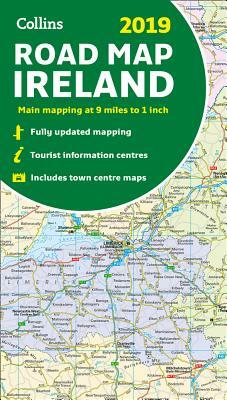 Full color map of Ireland at 9 miles to 1 inch (1:570,240), with clear, detailed road network and counties and new administrative areas shown in color. Main features: New administrative areas shown in color. Clear, detailed road network. Town and city names, rivers, lakes, spot heights, railway lines and canals clearly shown. City/town center street plans of Belfast, Cork, Dublin, Dún Laoghaire, Galway, Limerick Londonderry/Derry and Waterford showing places of interest. Full index to place names. Mileage chart. Car ferry routes. Key in English, French and German. Collins UK has been publishing educational and informative books for almost 200 years.